A very happy Gemma on the beach at . All photos by Andrew Essex. How long were you there? Ten days. Why did you go? Aching need to submerge in Caribbean waters. Who were you with? My family (wife and two kids). What's the #1 tip you'd give a friend who wanted to go? The Dutch were good administrators and flawed colonialists, and the island lacks many of the macro problems that can make the Caribbean a drag. 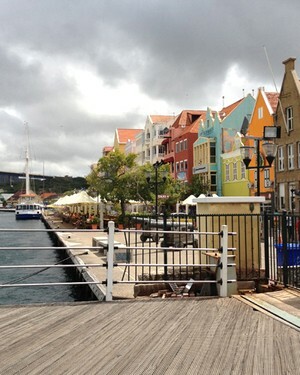 The charming, pastel-painted colonial capital city of Willemstad is a UNESCO World Heritage Site. Also, almost no bugs. What did you do? A whole lot of nothing, punctuated by snorkeling, scuba, and circumnavigating the entire island, which can be traversed in about three hours. Were you there for the right amount of time? Maybe a day or two too many for those with a tendency to need more topical variety. How did you get there? American Airlines with a quick and painless transfer in Miami. This was especially great: in Willemstad is a truly first-class, if deeply disturbing, slavery museum. It was really worth seeing, especially with our nine-year-old. And the Pontoon Bridge known as "the Swinging Old Lady." A leisurely drive up the west coast to Westpunt on a pretty, well-marked, and maintained road that cuts through hanging canopies of jacaranda trees. Along the way we stopped at a handful of incredibly beautiful swimming and snorkeling beaches. 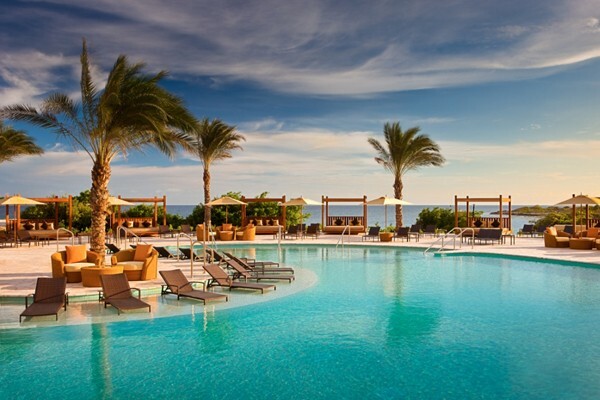 Photo courtesy of Hyatt Regency Curaçao. But this wasn't: The Hyatt isn't really for anyone who enjoys roughing it or dislikes engineered paradise. It's great, however, for those who want to relax, do a whole lot of nothing, and play with their kids in hermetic perfection. The beach is set on a channel, so it's not technically on the sea. This won't appeal to purists, but it's hard to resist when you're floating lazily and only half-watching your kids splash around in the shallow, protected water. 1. Meal: Surprisingly, the food was quite good at the Hyatt, especially Shor Restaurant, which is perched on a hill overlooking the sea. Sushi in the beautiful lobby was also a nice surprise. And the fish tacos at poolside were heavenly. The Hyatt is a 30-minute ride from Willemstad, so we opted to dine at the resort. 2. Neighborhood to explore: A morning trip to Willemstad to see the quaint colorful buildings, Pontoon Bridge, and slavery museum. 3. Site/place/thing you did: A drive up the west coast with stops at gorgeous beaches along the way to snorkel and swim. What's the local speciality? Iguana stew. But we did not partake. Site you didn't get to visit, but wanted to: The is said to be top-notch, with a dolphin interaction program known for drawing autistic kids from around the planet. 1. Glad you packed: All the obvious. Bathing suits, flip flops, and hats for all. Shorts and casual linen or cotton button-downs for him. Breezy dresses and shorts for her. Wooden bangles. Flat sandals. Snorkel gear for the avid underwater enthusiast and water shoes for the tender footed. 2. Wish you'd packed: SPF shirts for my kids. We hardly ever burn, however the sun is wicked hot. Also, sunscreen with zinc. We lugged at least eight tubes of 50- and went through it all and had to buy more on the island. And a magnified travel mirror with a light. The bathrooms are on the dark side. 3. Didn't need: White jeans! (For the wife, that is.) Too hot. 4. Brought back: A very nice tan. And beautiful photos of our children. Would you go back? If so, what would you do differently? Yes! And nothing. Any surprises? The biting bug population wasn't nearly at the level my wife dreaded. It's worse in Brooklyn. What was your Kodak moment? 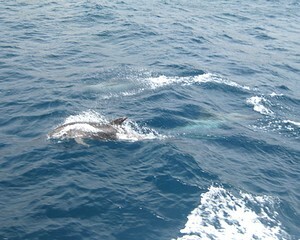 Unexpectedly sailing alongside a pod of some 30 dolphins en route to a dive. And plenty of shots of our kids, tanned and happy frolicking on the beach. Andrew Essex is CEO of Droga5, the award-winning advertising agency. You can follow him . He travels mostly for business but always for pleasure.